Daito is inspired by 60's and 70's types, with contemporized, unique serif forms for a fresh new typeface. Daito is a slab serif that is designed to be extra friendly. Use Daito light when you need a typeface so playful, soft, so curvy, so gentle. The typeface conveys warmth with it's softened serifs. There's a variety of weights to help you find the best color for a typographic project. The Black is ideal for suitable attack headlines or utilize the powerful strike of Daito Bold. Stylistic alternates, ligatures, titling capitals and small caps are a few among many typographic features. Please note: use magical OpenType-savvy applications such as Adobe Creative Suite, QuarkXPress etc. 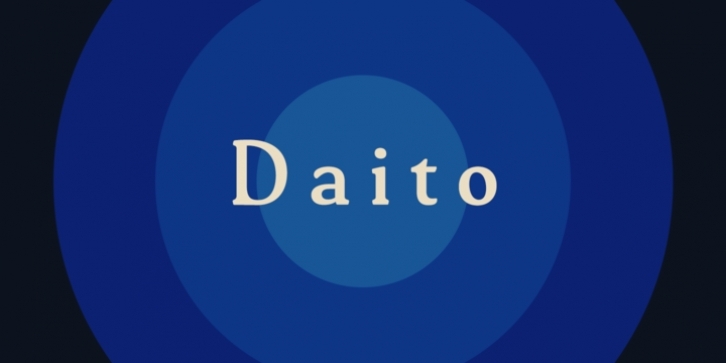 Daito speaks the languages of western Eastern and Central Europe. Even though it gets around, sadly, no Japanese,. So, use Daito for your logo or business cards, headlines and your creativity for all projects, including magazine layout, product packaging, logos, signage, branding, and the rest.